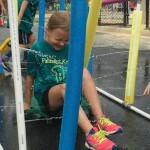 It’s time to get excited about Field Day! Students and teachers look forward to this day because it gets them outside and having fun with new and exciting activities. Another great aspect of Field Day is it teaches kids the importance of working as a team. We’ve highlighted 15+ team building games and activities that are both challenging and fun! At the end of this blog you’ll find a link for our 3 FREE Field Day Guides with detailed activities submitted by professional PE teachers. Happy Field Day! This specially designed Split Team Mug comes in two halves, each with its own handle. Students must work together to keep the water inside the mug. 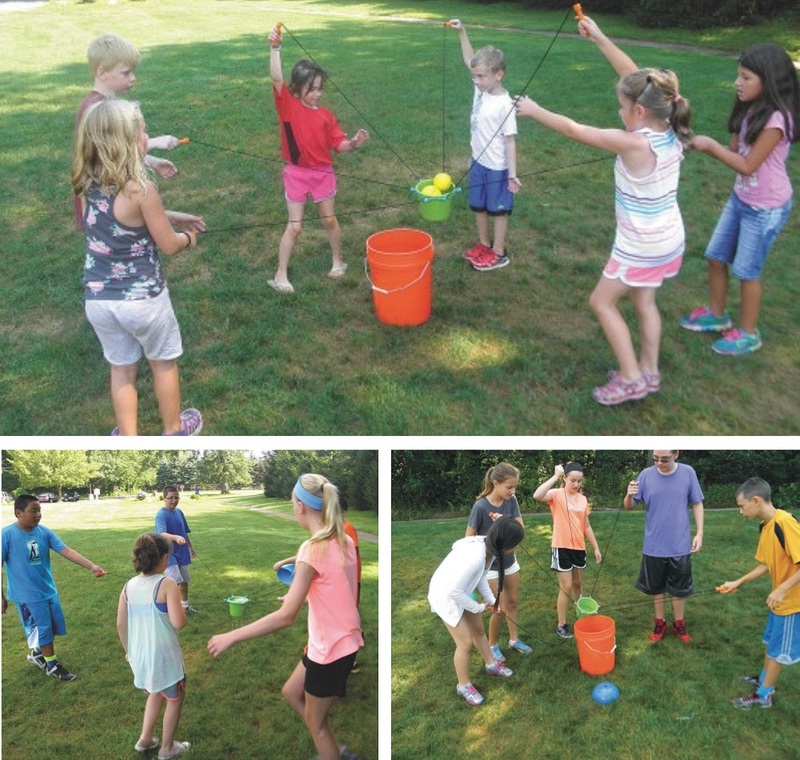 Divide your group into pairs during your Field Day event and have them dip the mug into a large bucket filled with water, then race to the end of the field and pour it into another bucket without spilling the water. If the team members don’t work together to keep the two halves together, the water will spill out! 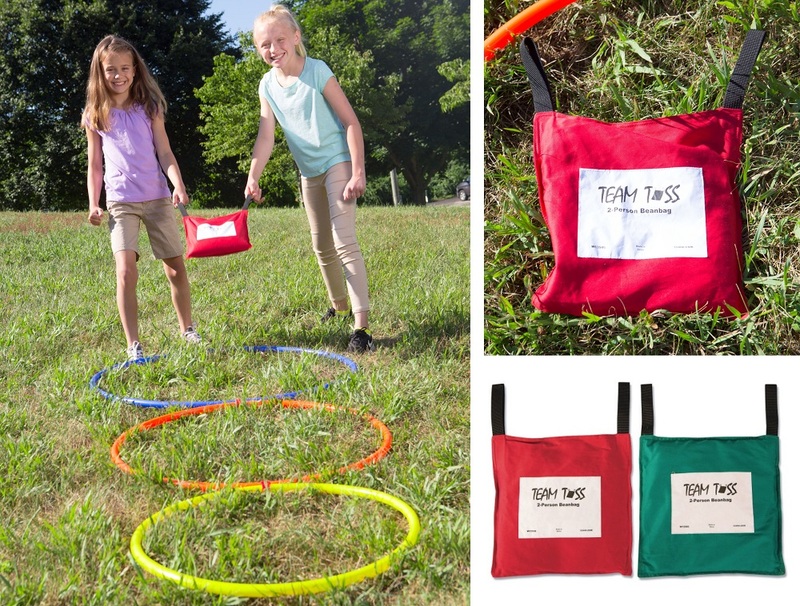 Our Team Toss set comes with 2 large beanbags with 2 looped handles each. Players must work as a team to toss the beanbags, either in a distance or accuracy throwing contest. Set up hula hoops and assign point valuves to each! This is a great addition to a team building field day event. Incorporate into a STEM or physics lesson and have players learn the optimum launch angle for maximum distance. The set includes 1 red and 1 green beanbag – each weighs about 3 pounds, plus an activity guide. How many ice cream scoops can you stack onto the cone? 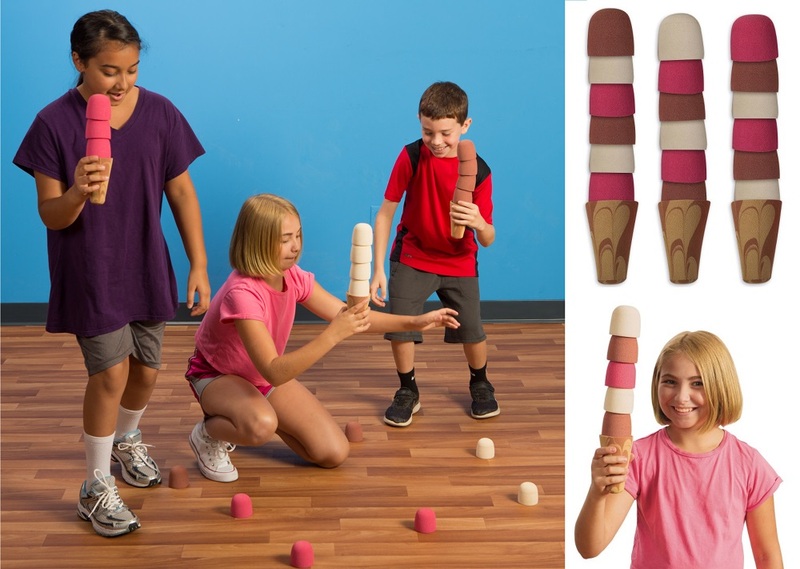 With this Scoop Stacking Challenge, kids can challenge their balancing and coordination skills. This can be an individual station, or divide your group into pairs for a team building activity where one person holds the cone and the other carefully stacks the scoops to see how many they can balance. Have a school wide competition – the most scoops wins! The pack includes 3 foamed rubber cones, 6 vanilla, 6 strawberry and 6 chocolate scoops. The activity guide has ideas for relay races, stacking challenges, and other fun calorie-burning activities. This Hole Game is great indoor team building Field Day activity! Scatter plastic balls around the room (we recommend pit ball) and then divide your group into teams of 2- 4 players. Provide each team with a fabric sheet that has a hole in the center. 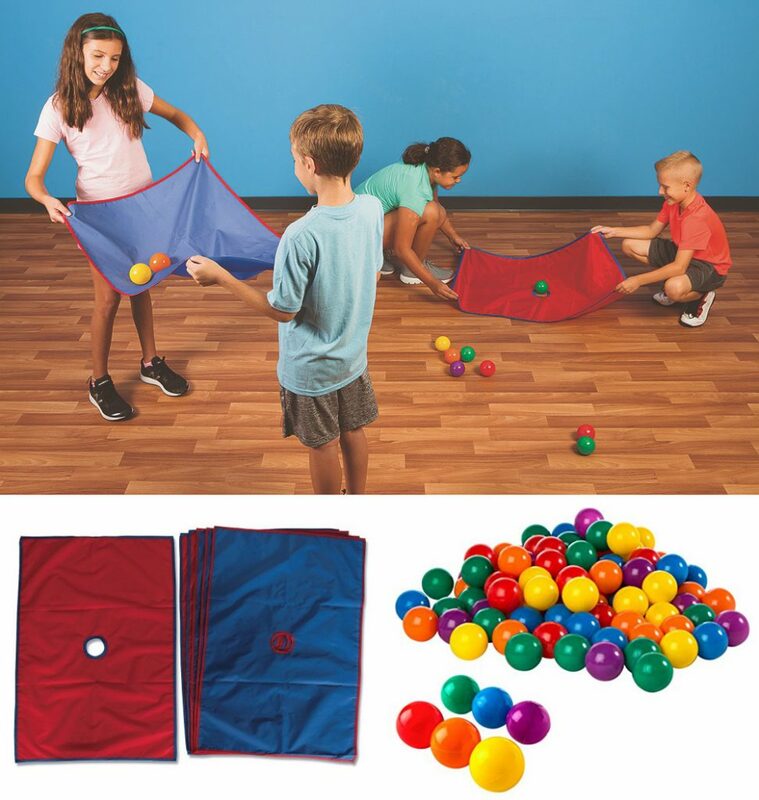 Students will race around the room to pick up one, two, or as many balls as they can with the fabric sheets. The challenge is to work together to get the balls onto the sheet, and keep them from falling out of the hole as the sheets are transported! 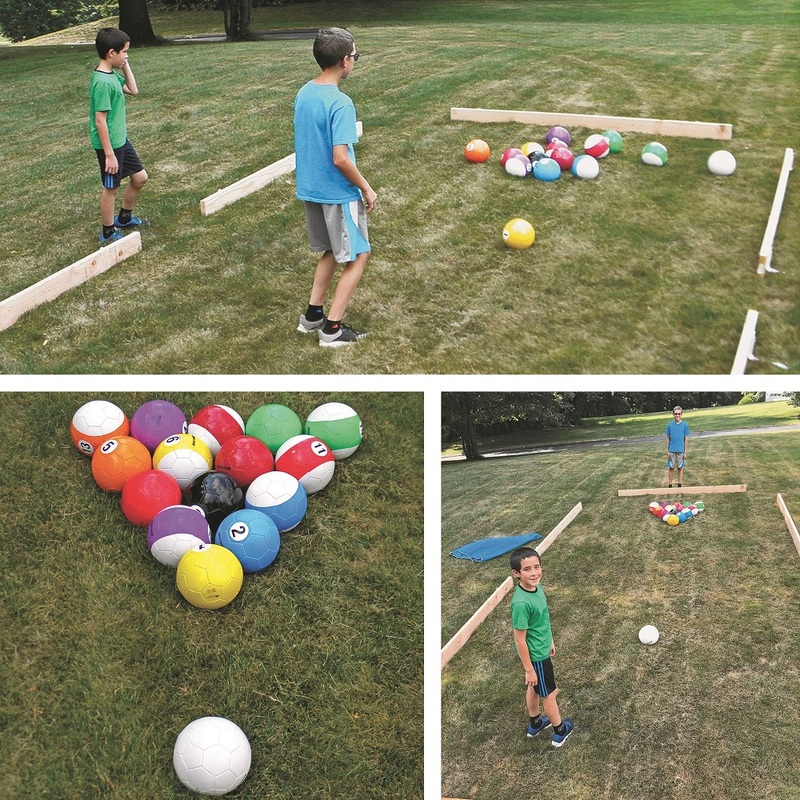 Soccer billiards is a popular new way to play pool using soccer balls. You play the game just like pool, but with your feet instead of a cue stick. Build your own table outdoors with wood panels, pool noodles, or cones. Indoors you can use either floor tape or liquid lines. The set includes 15 soccer balls with standard billiard ball graphics, plus 1 all-white soccer “cue” ball. All of the balls are standard size 3 soccer balls. 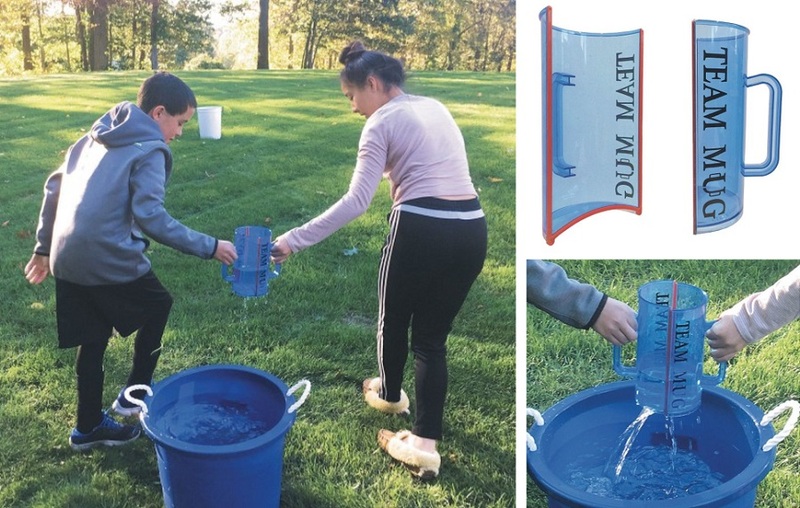 A fun new addition to your Field Day event! 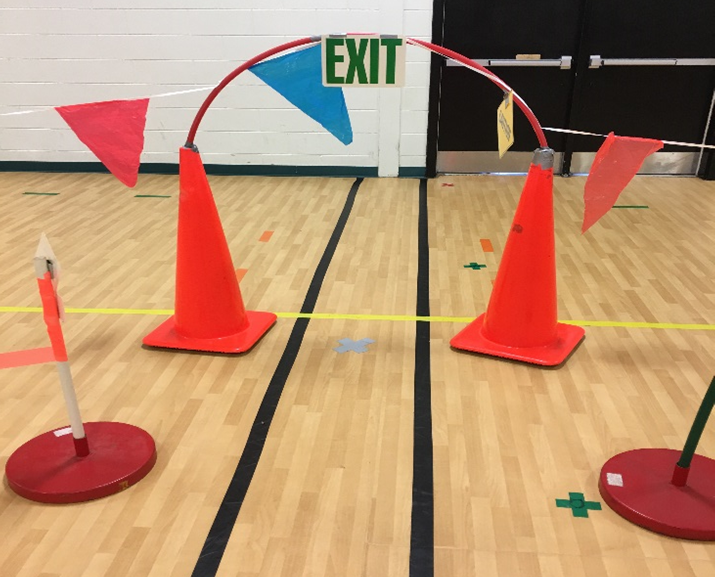 Set up an obstacle course for students either indoor or outdoor for Field Day using hula hoops and clips to keep them together! 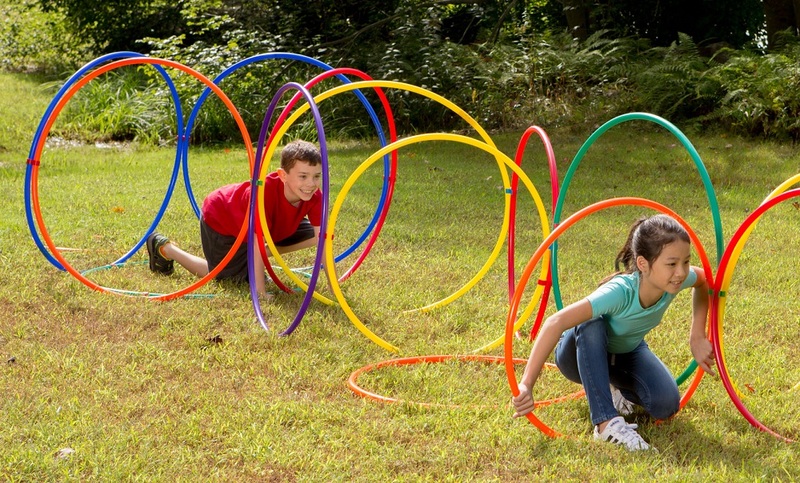 View our Hoop Clips blog to find out more activities you can do with these awesome clips. 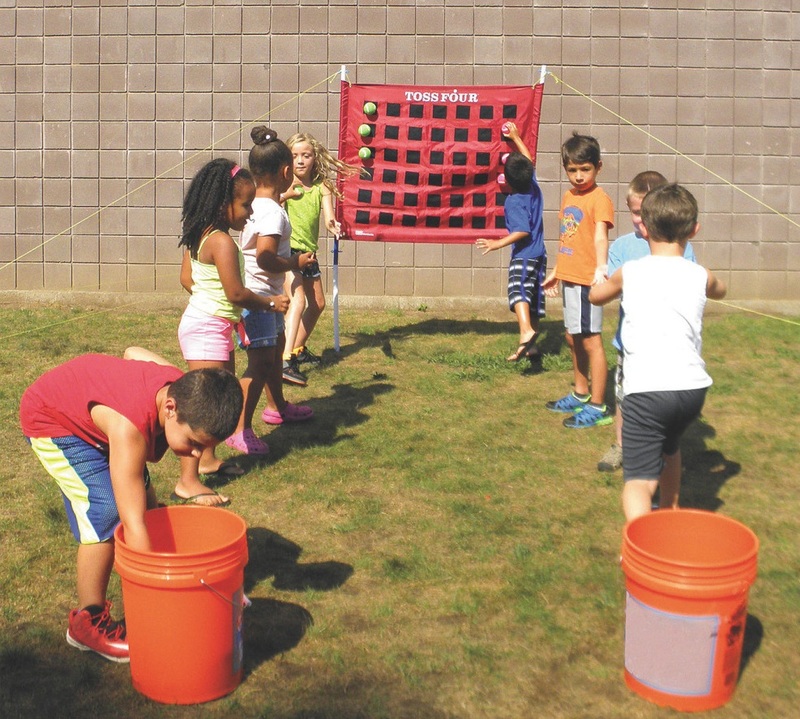 This Team Bucket Challenge game is one of our most popular for Field Day. Teams fill up their green buckets and race to transport and dump the water into a storage container before all the water leaks out of the bottom. The team with the most water in their storage container at the end of challenge wins. Divide the available players into two teams of 5 to 7 players per team. One player on each team will be the “Team Filler”, while the others will be “Team Transporters”. For the complete rules of the game plus more activities for this product, check out our Activity Guide. You can also try our Team Transport Challenge which has an activity guide too. Kids have a lot of fun with this activity trying to move forward, backward, and sideways! It takes a team effort and teaches cooperation and coordination. The Team Run Mat comes with 2 mats. Have kids divide into teams of 3 or 4 and race to the finish line. You can set up a course using cones or pool noodles. The team that reaches the finish line first wins! Our larger Run Mat can fit 6 or 7 kids. Field Day isn’t complete without a balancing race! For our Spectrum™ Jumbo Ostrich Egg and Spoons set, divide your group into teams of up to 6 and assign each team a colored egg and a spoon. 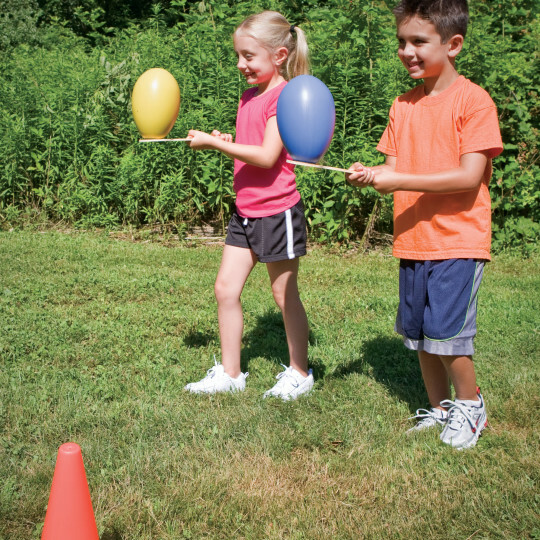 Use colored cones to designate a starting point and midpoint that each player on each team must carry the egg around and back to the starting line. If a player drops the egg while transporting they must stop moving, retrieve the egg, put it back on the spoon and then they may start walking again. The first team to have each person complete the circuit wins the race. Check out our Activity Suggestions for more fun ways to use this kit. 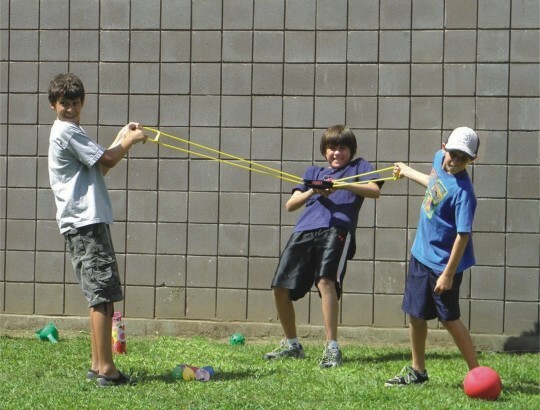 A classic game of Tug of War is great for a Field Day activity! Our new soft ropes are sturdy enough for adults and kids, and won’t cause rope burn. Make sure there’s an even amount of students on each side, and mark the grass for the center line. The rope comes with it’s own marker for the center. Variations: Instead of the players have the rope in their hands at the start of the competition, have the rope start on the ground and all players standing straight up. At a start signal, both teams scramble to pick up the rope and pull the center mark past the cone nearest them. 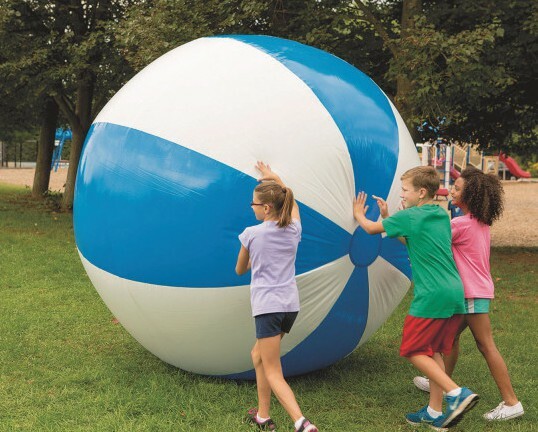 The Mammoth Beach Ball race is one of our favorite Field Day activities. Have students get into groups of 3 or 4. Each team member must keep their hand on the beach ball at all times. Set up some markers such as pool noodles as a roadway to challenge teams to keep the ball within the lines. The students must get to the end of the roadway with all of their teammates still touching the ball. This really takes a team effort to control the ball! Use a stop watch to time each team. The fastest time wins! Use the Blaster Balloon Launcher or Mega Ball Launcher to see which team can launch the furthest! Set up cones across the field as a marker. Another fun activity is to set up stacking buckets and have each team try to knock down the tower. Teams have to work together to figure out where to stand and how to position their bodies so they can aim the ball to the target. Sack racing is another great team building activity for Field Day. 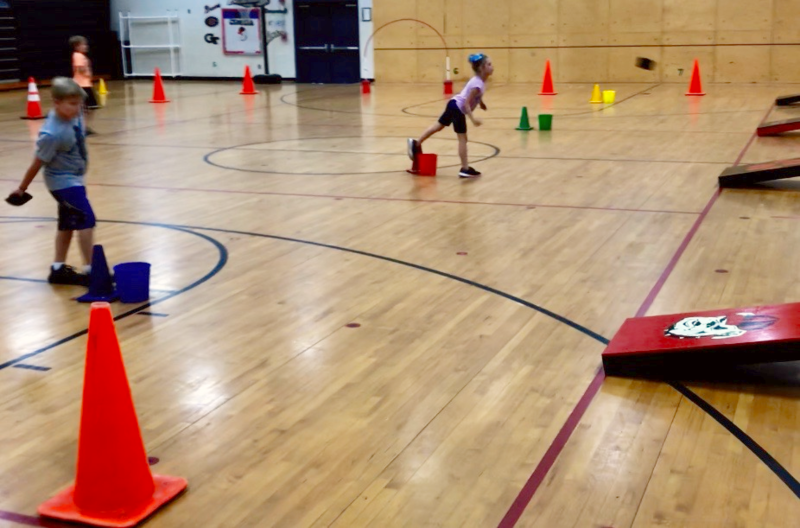 Using either two-person or three-person hop sacks, have students race through an obstacle course and to a finish line. The goal is to work together and hop through the course without falling! 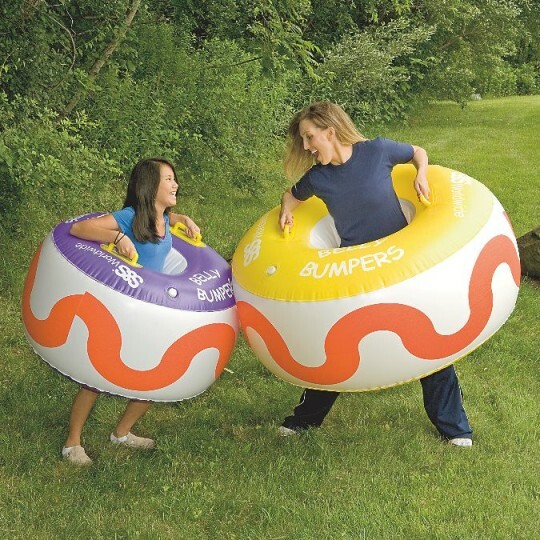 Belly Bumpers is one of the funniest Field Day activities we’ve seen, and kids love it. 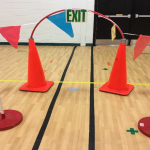 They can be used just for fun as bumpers, but for a team building concept you can divide students into pairs and have them run through an obstacle course. They cannot fall or they have to start again, and so does their teammate! Parachute games are perfect for a large group, and there so many activities you can do. One of our favorites is called Turtle – while in mushroom (raise the parachute up to fill with air), all participants create a giant turtle shell while on their hands and knees underneath the parachute. Now everyone has to work together to get the turtle to travel around with its shell still afloat. Check out all of our blogs on using parachutes for P.E. activities. Also check out our wide selection of parachutes for different sizes and designs. 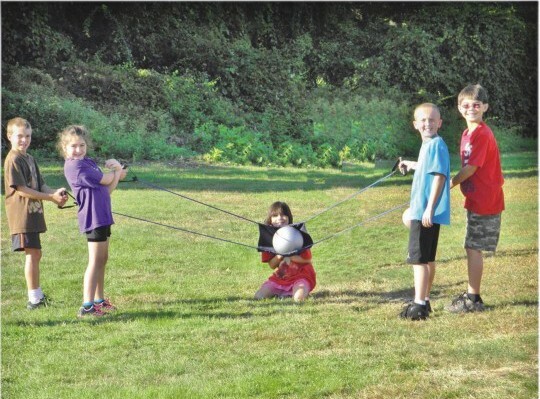 This Foam Co-Op-A-Walk™ activity is like sack races with a twist! Kids have to coordinate and walk together without falling. 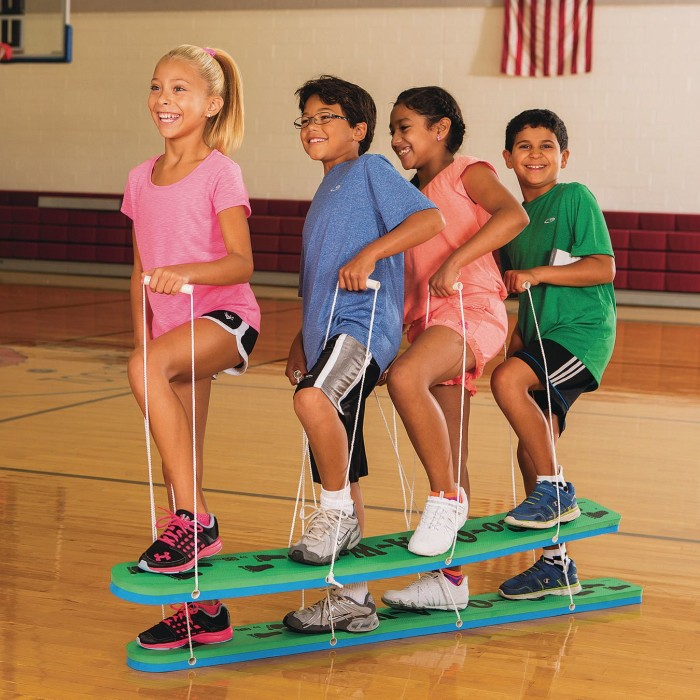 They’re fun and great for exercise, plus they make an effective lesson in teamwork and communication. We have a 2 person and 4 person version. Use this instructions guide to find out more. 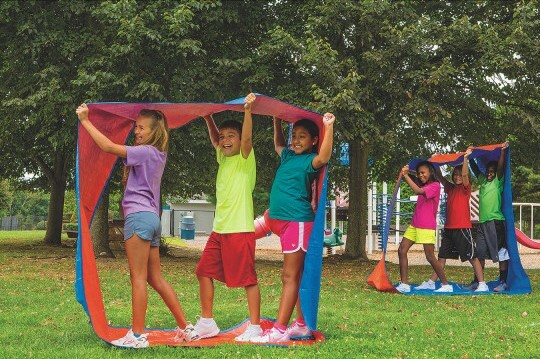 Play Runway Chute, Team Toss, or Parachute games with this cool Team Connect-A-Chute™ Field Day item. A great indoor or outdoor activity. Use this Activity Guide for all of the different ways kids can use this. 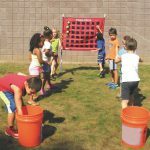 Want even more Field Day activities? This entry was posted in Active Play, Field Day, PE Activities & Games, PE Central and tagged activity guide, challenge, cooperation, coordination, field day, Field day activities, Field Day ideas, group, obstacle course, pe game, physical activity, race, team, team activity, team building, work together by S&S Worldwide. Bookmark the permalink. This is an excellent web site that gave me a lot of ideas to use in my classes. Thanks Kurt, so great to hear that our Field Day blog provided you with helpful ideas! I am writing from Serbia, a small country in the central part of Europe. I work as a kindergarten teacher with children aged 3 to 6 years, and I also work in a sports school. I very much like the props you use in activities with children. Can you tell me where to buy such props? Hi there, if you are looking for the products we talked about in the blog post, click on the title of each product and it will take you to the link on our website. For example, the Team Bucket Challenge title is linked and will take you to the bucket challenge product. Thanks and let me know if you have any other questions!